President Wilson was the first President to declare a national emergency, on February 5, 1917. Franklin Delano Roosevelt, Harry S Truman, Richard M. Nixon, James E. Carter, Ronald W. Reagan, George H.W. Bush, William J. Clinton, and George Walker Bush have all issued national emergency declarations. On Monday, September 10, 2001, nearly six years after he refused to put on the United Nations uniform and to submit to the command and control of a foreign military officer, Michael New has taken his fight for justice to the United States Supreme Court. J. Barrett Hyman, M.D. v. The City of Louisville, et al. Browner, et al. v. American Trucking Associations, et al. Our firm filed a second brief in the United States Supreme Court in the Boy Scout case — this time after certiorari was granted — on the merits of the Boy Scouts’ arguments for reversal. Chenoweth, et al. v. Clinton, et al. The Olson law firm filed an amicus curiae brief with the U.S. Supreme Court on behalf of Public Advocate of the United States and the Lincoln Institute for Research and Education defending the right of the Boy Scouts to determine their own leadership. Our firm filed an amicus brief for the National Citizens Legal Network, U.S. Border Control, Lincoln Institute for Research and Education, English First Foundation, and Policy Analysis Center in the case ofClinton v. Glavin in the United States Supreme Court in support of appellees. Our firm filed an amicus brief for the National Citizens Legal Network in the case of New v. Cohen in the United States Supreme Court in support of petitioner Michael New. On behalf of Citizens United, our firm filed a Petition for Writ of Certiorari in the case of Citizens United v. United States of America, et al. in the United States Supreme Court. Today our firm filed a Brief for Appellants explaining how the Freedom of Access to Clinic Entrances Act violates the First Amendment. 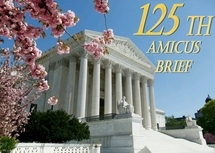 Our firm filed an amicus brief for Citizens United Foundation in the case of U.S. Term Limits v. Thornton in the United States Supreme Court. Our firm filed an amicus brief for the Abraham Lincoln Foundation for Public Policy Research, Inc. in the case of Michel v. Anderson in the United States District Court for the District of Columbia supporting the plaintiff’s request for a preliminary injunction. Howard Ellis, et al. v. Brotherhood of Railway, Airline and Steamship Clerks, et al. Representing Congressman Dickinson, this brief successfully urged the Supreme Court to grant certiorari to resolve the distinction between permissible and impermissible uses by unions of agency fees paid by those working men and woman who choose not to join unions but who are required to pay those fees under law.